John “Scotty” McGrandle in Spain. RGASPI, Fond 545, Opis 6, Delo 559. Just outside of Belchite towards Fuentes de Todos, a shell landed in the Estado Mayor of the Lincoln, killing commander Reiss and Battalion Commissar Parker. 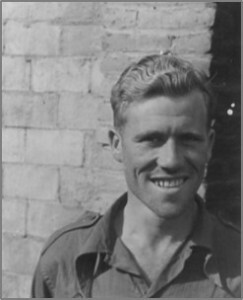 One of the corpse fell against Frank Rogers – a piece of shrapnel wounded him in the leg. It’s not a milk-and-water baby whom we have for a political commissar. It’s a veteran of our war who led the Lincoln Battalion (in those difficult April days) from which he came to join us. Back in the States, he was everything from a steel union organizer to a football player. He felt the heavy hand of coal barons in the mine center of Pittsburgh where he spent some time in jail for organizing activities. So determined was he that he got together a “Kangaroo Court” in jail to form the fore-runner union of the CIO and this “court” right then and there elected an executive committee! His revolutionary activity did not lull his interest in sports. He became a leader of the Labor Sports Union to help give the amateur sportsman a real chance. This took him to Germany in 1931 for the Labor Olympics – known as the World Spartkiade. The fascist minded police (even during that time) put their foot down and threw him into a German cooler. The Soviet Union then proved a saver and he went there, where solidarity gives without saying. Just like many of us who recognized that the fascist rebellion was an assault on decent life everywhere, he came to Spain to put to use his energy, intelligence and leadership in driving reaction out of Spain. We can count on our Commissar Rogers to use his physical prowess and organizing ability to play an important part in the coming victory of the Spanish Republic.